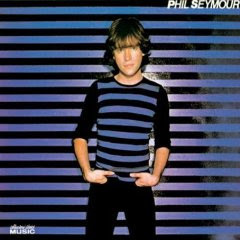 Phil Seymour is an important footnote in the history of power pop music. Although nowhere as well known as the big names of The Raspberries and Badfinger, Seymour was much loved in his brief career before passing away in 1993. Seymour was one of the two power pop guns to come out of Tulsa -- the other was Dwight Twilley. As a matter of fact, Seymour and Twilley were signed to Shelter Records as The Dwight Twilley Band, both of them playing nearly all the instruments (Seymour played drums and bass). Out of nowhere, they had a huge single with "I'm On Fire," which would mark their style of simple major chord power pop with a distinct twangy guitar, usually courtesy of Bill Pitcock IV. The pair fell out and Twilley hit the road as a studio musican, singing backup on a number of albums, including early Tom Petty. Signed to Boardwalk Records, Seymour's first solo album was like a poppier, cleaner version of the music he'd been doing with Twilley. For some reason, his adopted that striped half-sleeve shirt not only on his album cover, but his videos and live performances. I guess in a weird symbolic way, the style fit him, as his music was still quite simpley arranged power pop. "Precious To Me" was his only big hit off the record, although there were many other great little songs on there. If "Precious To Me" was released 10 years earlier, it may have been some Frankie Valli hit (with a little of Bob Gaudio's production razzle dazzle, of course) or perhaps would have seemed right on the "Urban Cowboy" soundtrack in a honky tonk version a year earlier. Sometimes the hardest thing to do is to keep it basic and simple, which "Precious To Me" is, not deep, not ornamented, but lots of Seymour vocal overdubs, a nice tambourine on the two and four beats, and an easy guitar lick. Two "Precious To Me" videos: the first, the official black and white version, and then Seymour -- in red and black stripes -- performing it on a TV show. Gracias es una de mis preferidas y es la primera vez que la veo en video.